In this article, we are going to discuss one of the best lock screens apps that are available in Play Store. Talking about the lock screen, they had been evolved over years from various slide to unlock types and all the manufacturers make sure that they show their personal touch on the lock screen. Moreover, it is has been some sort of smartphone security aspects these days. If the users are bored of their lock screen that their device manufacturers provided or want to have more features than provides, it’s recommended that they had to try out the lock screen given below. 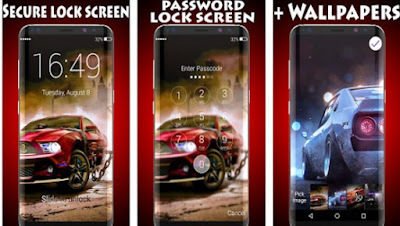 What is Super Racer Car Lock Screen Wallpaper? It is a screen lock app for all Android users that are tired from their boring launcher screen lock. If you want to breathe life into your phone or tablet and be different from your friends, then Super Racer Car Lock Screen Wallpaper is the app you need. Designed with intuitive user interface, this is a feature-rich app that lets you personalize your device the way you want it. You can easily choose a background from its beautiful and stylish collection of HD images, set a password to protect your privacy and display real time clock and date. The app also includes various unlocking methods, such as Swipe, Pattern, PIN, Password and Text. Super Racer Car Lock Screen Wallpaper is not just an ordinary screen lock app, it is a companion for your everyday life. Feel the beauty and uniqueness of this elegant and modern lock screen, download it now for free from the Google Play Store’s link below and enjoy!